ILX Group’s accredited ITIL Foundation and Practitioner blended learning course contains all of the training and materials you need to attain both the Foundation and Practitioner qualifications in ITIL. The Foundation course is delivered via e-learning, with a two-day classroom workshop for the Practitioner element of the course. 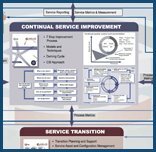 The course will benefit IT service management professionals who want to become ITIL Foundation-certified to understand the global language of ITSM and then want to learn how to adopt and adapt it in the workplace. ITIL Practitioner is a long-term investment in your team’s professional development.